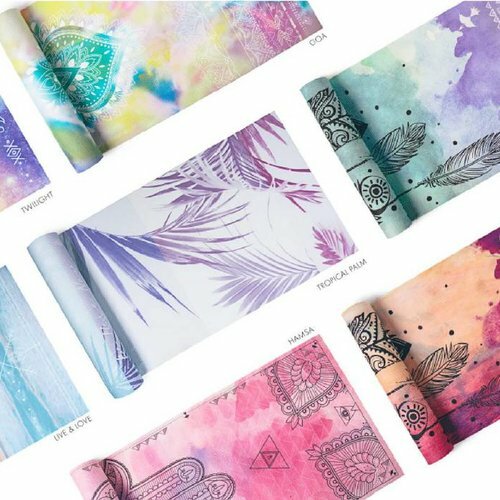 Vagabond Goods makes yoga mats with the most beautiful prints. If this doesn't work to get you on your yoga mat... Sustainably printed using non-toxic, solvent free, UV cured inks. Now also in the Netherlands. These beautiful yoga mats are latex-free and sustainably printed using non-toxic, solvent free, UV cured inks. These lightweight premium yoga mats are 182 x 61 cm and extra thick (0.6 cm). The non-slip pillow texture adds extra comfort in high tension positions. PAY ATTENTION PLEASE: These yoga mats are designed for yoga styles such as hatha and yin yoga. If you practice a yoga style where you sweat a lot, such as power yoga, ashtanga yoga, bikram yoga and other hot yoga styles, we highly recommend using one of the Vagabond anti-slip yoga towels! Vagabond yoga mats are durable and easy to care for. Simply use mild soap and water, wipe down and air dry. For every Vagabond yoga mat sold, a tree is also planted by Vagabond Goods. What is your favorite Vagabond yoga mat design?